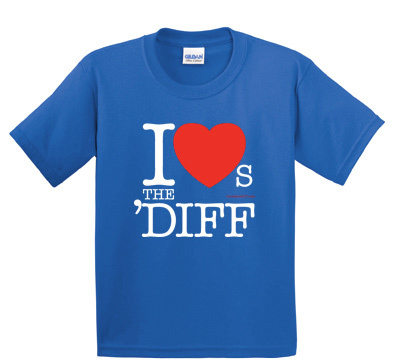 I Loves The 'Diff T-Shirt Shop | Cardiff rocks. So does this t-shirt. An unbeatable introductory offer, this. Basically, if you were getting two anyway, spend £3 more and get a third. Aren't we nice? Please type in the box below to tell us which t-shirts you would like (choose from indigo, royal blue, pink and yellow), and also the sizes of each t-shirt (size options are listed on the right). Choose any three tees, in any size in any of the four colourways. Let us know what you'd like! 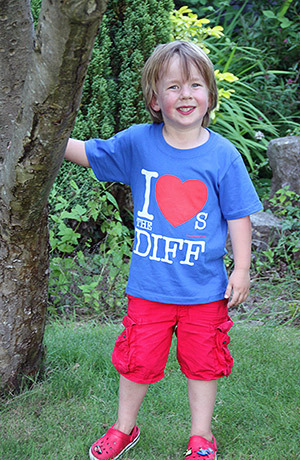 High quality heavyweight 185gsm 100% pre-shrunk Gildan cotton t-shirt, professionally screenprinted in (and with love for) the 'Diff. *Price of £10.99 includes UK p&p only. Any questions, just email us.